Looking south from Kāpiti Island. Kāpiti Island is a small but conspicuous island about 5 km (3 mi) off the west coast of the lower North Island of New Zealand. It is 8 kilometres (5.0 mi) long, running southwest/northeast, and roughly 2 kilometres (1.2 mi) wide, being more or less rectangular in shape, and has an area of 19.65 km2 (7.59 sq mi). The island's vegetation is dominated by scrub and forest of kohekohe, tawa, and kanuka. Most of the forest is naturally regenerating after years of burn-offs and farming, but some areas of original bush with 30 m (98 ft) trees remain. Its name has been used since 1989 by the Kāpiti Coast District Council, which includes towns such as Paekakariki, Raumati, Paraparaumu and Waikanae. Kāpiti Island seen from Waikanae Beach, Kapiti Coast. In the 18th and 19th centuries Māori settled on the island. Te Rauparaha formed a base here, and his Ngāti Toa tribe regularly sailed in canoes on raiding journeys up to the Whanganui River and down to Marlborough. In the Battle of Wairo (1824) the Ngāti Toa destroyed a force of 2,000 mainland warriors who had landed at the northern end of Kāpiti in an attempt to capture the island. The conservation potential of the island was seen as early as 1870. It was reserved as a bird sanctuary in 1897 but it was not until 1987 that the Department of Conservation (DOC) took over the administration of the island. In the 1980s and 1990s efforts were made to return the island to a natural state; first sheep and possums were removed. In an action few thought possible for an island of its size, rats were eradicated in 1998. 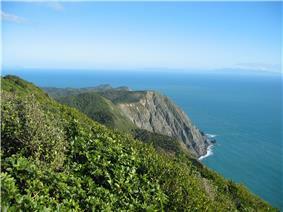 The island is the site of Kapiti Island Nature Reserve and adjoins the Kāpiti Marine Reserve. Most of it is in New Zealand Crown ownership. The island is home to a number of native birds, mostly re-introduced. These include takahe, North Island kōkako, brown teal, stitchbird (hihi), North Island saddleback (tieke), tomtit (miromiro), fantail (piwakawaka), morepork (ruru), weka and North Island robin (toutouwai). The brown kiwi and little spotted kiwi were released on the island between 1890 and 1910, and the island is now the stronghold for the latter species. Rat eradication has led to increases in red-fronted parakeets, North Island robin, bellbirds, and saddlebacks, and the island is considered one of New Zealand's most important sites for bird recovery, as well as a major breeding site for sea birds. In April 2005, the critically endangered short-tailed bat was introduced to the island from a threatened population in the Tararuas, providing them with a separate, safer habitat. On 14 June 2007, one of the buildings at the Department of Conservation ranger station caught fire, sparking a major emergency operation to prevent the spread of fire to the native bush. Thirty firefighters were flown to the island and managed to contain the blaze, preventing serious damage to the ecosystem. A stoat, an introduced mustelid responsible for decimating the bird life in New Zealand, was seen on the island in December 2010, and by August the next year the Department of Conservation had killed three of them. 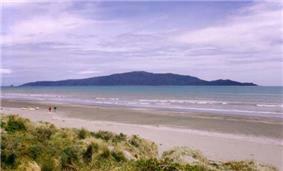 It is thought that they could not have swum the five-kilometre stretch of open sea from the Kāpiti Coast. ^ Blundell, Kay (15 June 2007). "Mass Effort Quells Kapiti Island Fire". The Dominion Post. Retrieved 1 August 2015. ^ Blundell, Kay (27 August 2011). "Kapiti Island: Stoat Finds Threat To Kiwi". The Dominion Post. Archived from the original on 25 March 2012. Maclean, Chris (1999). Kapiti. Whitcombe Press.